...even now many antichrists have arisen. 22 Who is the liar but he who denies that Jesus is the Christ (Messiah)? This is the Antichrist, he who denies the Father and the Son. 23 Whoever denies the Son, the same doesn't have the Father. He who confesses the Son has the Father also. So then, an antichrist is basically someone who denies that Jesus is God's son or that God has a son. This is very important. 1 John 4 tells us there is also a "spirit" of the Antichrist. 2 By this you know the Spirit of God: every spirit who confesses that Jesus Christ has come in the flesh is of God, 3 and every spirit who doesn't confess that Jesus Christ has come in the flesh is not of God, and this is the spirit of the Antichrist, of whom you have heard that it comes. Now it is in the world already. So denying that God has a son, or that Jesus Christ is not the son and has not come in a human body, is really from an evil spirit - the spirit of the Antichrist. With that, let's look around the world and see who most promotes and affirms the spirit of the Antichrist. The Quran literally pronounces a curse on those who believe that Jesus is God's Son. People who say such things utter "gross blasphemies" and are likened to "unbelievers" or infidels. Without question then, in this regard Islam is an antichrist religious system. "Far be it from God that he should have a son!" These words encircle the inside of the Dome of the Rock Mosque in Jerusalem. This is the very location where for centuries God's people; the Jews, worshipped in their Temple awaiting their Messiah. This is also where Jesus, the Son of God and the Jewish Messiah will someday rule over the earth. Islam has literally built a monument of utter defiance to this future reality." Rev 20:4 - I saw thrones, and they sat on them, and judgment was given to them. I saw the souls of those who had been beheaded for the testimony of Jesus, and for the word of God, and such as didn't worship the beast nor his image, and didn't receive the mark on their forehead and on their hand. They lived, and reigned with Christ for a thousand years. 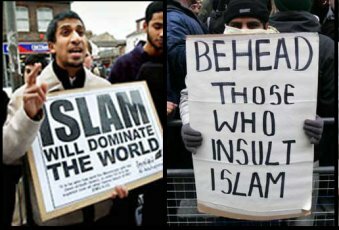 There have been quite a few beheadings in the news lately, mostly occurring in the Middle East by Muslims against "infidels". ISIS/ISIL is making headlines as it tortures, crucifies and beheads Christians in northern Iraq and Syria. Very recently Muslims in Afghanistan stormed the UN mission there and killed at least 11 people, 2 of which were beheaded! The reason? A church in Florida burned a Quran. To Muslims this is blasphemy, and the penalty for blasphemy is death. (It doesn't matter to these Muslims that these UN workers had nothing to do with the Quran burning and they would most likely have each personally condemned the act). But understand that preaching that Jesus is the Son of God is also blasphemy, and even more worthy of death than burning a Quran (because they believe that saying God has a son is idolatry, and this is the worst offense in Islam - search the web for Shirk Islam to learn more). If you look around the world, you see that Muslims are the only religion who practice beheadings. So this aligns perfectly with the Bible in relation to the forces of the Antichrist. Did you know there are 666 words in the Quran? At least one sect of Islam associates "the perfect number 666" with the Quran. The following links to Islamic sites connect the Quran and it's Messenger, to the number 666. Search the Web for quran 666 or Quran 666. This is incredibly significant, for now we have at least some Muslims embracing the number of the Antichrist. When we consider the next section, the pieces all begin to fall into place. Those in Islam that believe in the number "666″ and its purity say that Satan used Christians to pervert the Bible. They believe that the book of Revelation was inspired by Satan and that he used the number "666″ as a bad number in order to prevent Christian people from accepting the Quran and the teachings of Mohammed because of fear. But someday all of the events foretold in the Bible will come true, eg. the reign of the Antichrist, requirement to worship him or his image, requirement to wear his Mark on the right hand or forehead to be able to buy and sell - and thus prove the prophecy was true and that it was given by ALMIGHTY GOD. And all those who worshipped the Beast (Antichrist) or wore his Mark will be eternally condemned to the Lake of Fire. This means everyone, Muslim and non-Muslim, who wear the Mark of the Beast. In recent years it has become more generally known by western Christians that Muslim traditions hold there will be "Muslim messiah" figure who will arise in the final 7 years of this age. Amazingly, this person bears striking resemblance to the Antichrist of the Bible. Iran: On September 17, 2005, the newly elected President of Iran, Mahmoud Ahmadinejad addressed the United Nations National Assembly in New York City. American President George W. Bush sat in attendance. Concluding his speech, Ahmadinejad made a plea to Allah to speedily bring forth the emergence of the mysterious Islamic Messiah figure known as Imam Al-Mahdi. Did you know that the Islamic Republic of Iran, founded after the Islamic revolution of 1979 has as one of its stated purposes to usher in the coming of the Mahdi? Ahmadinejad is just being true to the beliefs of their Islamic republic. Here's an article "Iran website heralding 'Mahdi'". Here's the Wikipedia article about the Mahdi. A Powerful Political And Military World Leader. From the Bible we learn that in the last-days the Antichrist will emerge as a man who will lead a very powerful world empire the likes of which history has yet to produce. From the Islamic traditions and Muslim scholars the Mahdi, like the Antichrist, is also prophesied to be a political and military world leader unparalleled by any other throughout world history. A Spiritual World Leader. The Bible establishes the fact that the Antichrist will be a spiritual leader whose authority will be forcefully acknowledged worldwide. Anyone who does not worship him or his image will be put to death. Likewise, the Mahdi of Islam will be the leader a worldwide worship movement. It will be a worship movement that will seek to cause anyone who practices any religion other than Islam to renounce their faith and worship Allah, the god of Islam. The Mahdi, "will govern the people by the Sunnah of their Prophet and establish Islam on Earth." And, "Islam will be victorious over all the religions." Targeted Campaign Against Jews And Christians. The Bible is very clear that Satan, through the Antichrist, will specifically target first Jews and then Christians for death. It says, "He was given power to make war against the saints and to conquer them" Rev 13:7. And, "He will speak against the Most High and oppress his saints and try to change the set times and the laws. The saints will be handed over to him for a time, times and half a time (3 1/2 years)" Daniel 7:25. The Bible is clear then, that the Antichrist will specifically target those who resist his attempts to establish his cult religion all over the earth. From the book of Revelation as well as the Prophet Daniel, we see that the two groups that Satan is most enraged against are the Jews and the Christians. Interestingly enough, Islamic tradition speaks much of the Mahdi's special calling to convert Christians and Jews to Islam, yet speaks very little specifically of conversions from other faiths. It seems as though converting Christians and Jews to Islam will be the primary evangelistic thrust of the Mahdi. The Establishment Of The Temple Mount As The Seat Of Authority. According to the Bible the Antichrist will specifically set up his "throne" in "God's Temple". The location of the Jewish Temple has always been on Mt. Moriah in Jerusalem. Today, Mt. Moriah, sometimes known as the Temple Mount or in Arabic as Haram Al-Sharif, is the location of two Mosques and is considered to be the third holiest site of Islam. Likewise the Mahdi is said to attack Jerusalem and re-conquer it for Islam in order that the new Islamic rule over the earth will be established from Jerusalem. Seven Year Treaty With Israel. After rising to power the Antichrist is said to "confirm" a treaty with the nation of Israel for seven years. Again, similarly the Mahdi is said to be one who will initiate Islam's fourth and final treaty between "the Romans" and the Muslims. (Romans should be interpreted as Christians or the West in general -- the executioners of Nicholas Berg in their pre-execution statement addressed President Bush as, "You, O dog of the Romans"). The Rider On A White Horse. The final similarity between the Antichrist and the Mahdi that we will discuss here is the fact that both the Antichrist and the Mahdi are identified with a biblical passage that describes a rider on a white horse. While this could be literal, it is most probably a symbolic picture of the two men. The amazing thing is that the origin of the biblical tradition of the Antichrist on a white horse and the origin of the Islamic tradition of the Mahdi on a white horse are both attributed to the same passage in the Bible - Rev 6:1-2. Both have a false prophet. Revelation is clear about the Antichrist having a false prophet: But the beast was captured, and with him the false prophet who had performed the miraculous signs on his behalf. Rev 19:20. One of the interesting aspects of the coming of the Mahdi is that he is to be accompanied by "Jesus". In Islam, Jesus was a great prophet, but a lesser prophet than Mohammed (rather than the unique Son of God who paid for man's sin and rose from the dead). They think their Jesus will somehow appear on Earth when the Mahdi arrives. But our Jesus warned us there would be false Messiahs and that "many would come in my name". So a false Messiah appearing is not surprising to us who know the scriptures and our Lord. There is more, but these are the main points which connect the Biblical Antichrist with the Muslim Mahdi. I recommend reading answering-islam.org to learn much more. And now for the most amazing discovery about this connection. Unless you verify it for yourself. And you are responsible for using them. TRUTH stands out clear from error!" and the Truth shall set you free!" No other person has had such an effect on human lives as Jesus. 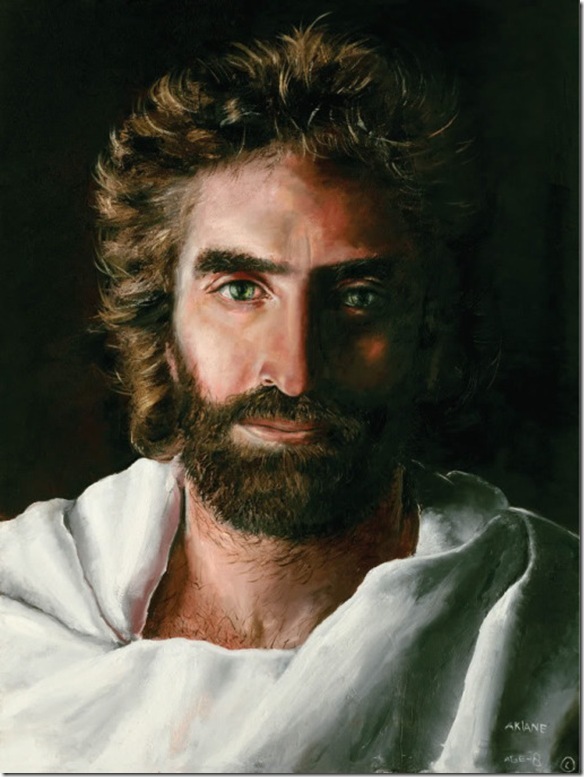 He came back to life again and millions say they know Him today as a friend, healer and helper in their lives. He healed while on Earth and He still heals today! 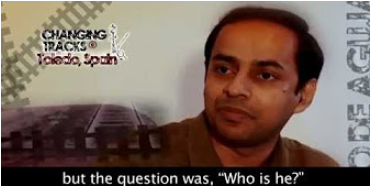 Below are some links to see the real testimonies of former Muslims who have had life-changing experiences and found forgiveness and hope with the living Saviour, Jesus Christ. In my own experience, I can testify as to what Jesus did for me. He made me into a new person in a "lightning strike" sort of way - I was born-again and filled with the Spirit of the living God. If Jesus wasn't the Son of God, he could not have changed me - but he did change me (and millions of others) and so he can only be the Son of God. Only God can make a person to be born-again (its a spiritual cleansing of your sins, after which you feel like a newborn baby inside). Then you have a connection to God and a new relationship with the Heavenly Father for the rest of your life. Its amazing and anyone can have this - if you will only believe you will be rewarded with forgiveness and his Spirit. But if you refuse to believe then you will go on to the grave as you are now - unforgiven and headed for hell (in the Lake of Fire forever and ever). 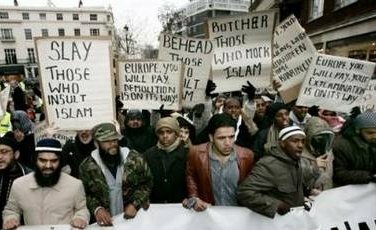 There are more than 100 verses in the Quran advocating the use of violence to spread Islam, which is exactly how Islam was historically spread. The word "Islam" has been falsely proclaimed by Muslims to be a peaceful. The word Islam, actually means "submission" to the loveless Muslim god of intolerance. Muhammad led 27 military campaigns against innocent villages and caravans & planned 38 others. When your city/nation is conquered by Muslims, you are given 3 choices: 1. Convert to Islam, 2. Have your head cut off, or 3. Live as a second class citizen, being treated like a dog and taxed into oblivion. This is a fact. You can look into it yourself and see. Do Christians always live up to such ideals? No, but this is what we will be held accountable to. When Anders Breivik massacred all those people in Norway recently, he was acting against the gospel of Jesus Christ and the entire New Testament teaching. No true follower of Jesus Christ would or could do such a thing. So now you see there are big differences between Islam and Christianity. Christians & Jewish martyrs say; "I will die for what I believe". A Muslim jihadist says; "you will die for what I believe"....or another way of saying it, "I will kill you for what you believe"
Watch this African woman healed of a horrible body poison disease - in Jesus name! Boy in Africa Raised From the Dead after being dead for 24 hours! !